Mood rings famously are meant to change color to reflect the mood of the wearer. Some are cheap and ugly. Some are expensive and set in precious metal. All work using the same mechanics. Mood rings first became a fad in the seventies. The rings consisted of circular ‘stones' set on metal bands. The stones were supposed to change color depending on the mood of the wearer. The stones measured the heat coming off the body of the wearer. In theory, this had something to do with their mood, since stress or fear tends to send the blood away from the extremities and cool them down. In fact, the color of the stone probably had more to do with body chemistry and whether or not its wearer had just been holding a cup of hot soup. Even though mood rings don't measure mood, they do measure heat, and they do so by changing color. That they do so reversibly and without burning is relatively rare. Unlike many things, they change color not by adding a new component but by changing the position of their existing components. 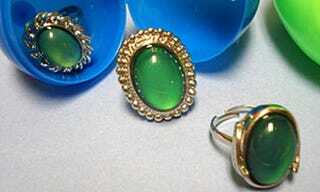 Mood rings are clear plastic or glass beads which enclose liquid crystals. The crystals are suspended in layers inside the ring. When waves of light hit those different layers, the light is reflected back. Those reflected waves interact with each other, just like waves of water do in a pool. Intersecting crests grow higher and troughs grow lower, while crests that meet troughs annihilate. The resultant energy of all these different interacting waves is a dominated by one particular wavelength and frequency – one strong color. If no temperature change occurs, the ring will always reflect back this one color. However, if the ring's wearer gets really calm and happy, or holds a really warm cup of soup, the liquid crystals are disturbed. Heat, as most readers know, kicks atoms into gear. It makes them vibrate faster and faster. This causes expansion. In the case of liquid crystals, this expansion causes the crystals to twist. Certain sections of the layers of crystals heat and expand faster than others. These sections push outward, wrenching the rest of the system and causing the entire structure to change. This change in structure means that the light coming in hits the layers a different way, the interference pattern changes, and the wavelength – or color – of the outgoing light changes. Via How Stuff Works, About.com and World Lingo.